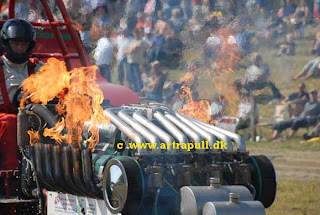 Last weekend Eurocup in Herning took place . We went there friday and stayed with the Black Lady II team untill sunday . wery nice weekend , weather was excellent teamperatur about 30 degrees celsius and no clouds at all. With Herning last weekend its time for an update on the Eurocup..
Its still tight at the top in the Prostock class Rocky taking the win has put the pressure on the others for the final round at Bettborn, but with 2nd place man John Deere only 7 points behind it should be an interesting final! The Superstocks now seems like a non-event, only 3, yes 3 pullers going to Lubersac leaving Magkal Bits 'n Pieces 18 points Ahead..
Could it have somthing to do with three Eurocup rounds in a row ??? I thought there was meant to be a weekend gap between a Eurocup event ? ! Its a bit tighter in the Mini class with the Lambada boys only 10 points ahead, Its not in the bag yet with 3 tractors close behind them we could be in for some drama at Great Eccleston! Black Power! After just missing out last year well done to Paul and the team.. it was a close finish for 2nd place between the Dutch Green Sprit and the German Le Coiffeur the two griffon boys finishing on the same points ! So with just a round at Great Eccleson for the mini's and Bettborn for the prostocks, superstocks and 4.5 mods it hopefully will be an exciting finish to the season ! 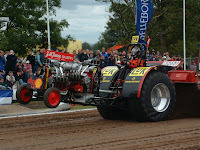 Next year the EK Tractorpulling 2009 will be held in the Netherlands in Bakel just as in 2002. I still don't have constant internet access... (Living in a little single room apartement for now in an area with NO pulling and internet access is upon the goodwill of the landlord, who unplugs it, when he's not at home - and him being a firefighter makes for some weird working times). The other thing is, there is a lot of people on holiday at our company and we're working saturdays - which prevents me from going to the pulls. So doing stuff on the website is more or less impossible. After almost 30 years in the sport, I have REALLY lost interest for now. 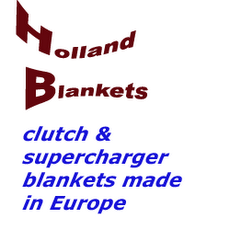 What went on at Bernay and Putten as well as afterwards is ridiciolous. I don't know how to go on with this site. If some of you guys feel like they want to contribute, let me know and I'll get you writing permission on here. That will keep the site alive. We just did the first start-up of Truckpower and it went well. The way it looks I should have regular internet access by the beginning of the week again. Then the quiet times on here should be pretty much over. There is a bunch of new pictures in the various picasa galleries and also some stuff and complete tractors for sale in the classifieds section. Sorry for the delay, but here it comes. 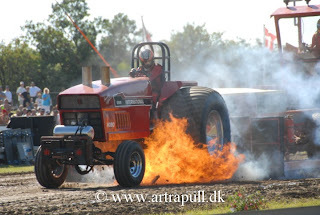 5th round of the Danish championship took place at "Korskro" Esbjerg, Denmark this weekend.